I am finally getting around to making videos of my favorites from recipes past, and Huevos Racheros is one of my extra tasty ones. This Mexican breakfast has corn tortillas combined with warm eggs and tangy tomato salsa, plus cheese melted into creamy refried beans. That's a lot of flavor to start the day. 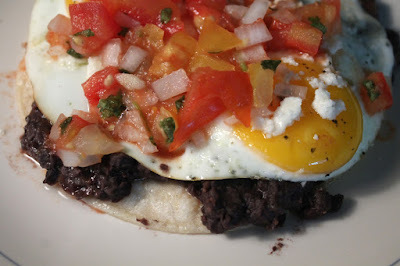 Besides a simple fried or scrambled egg, I make Huevos Rancheros the most. Mainly because I keep a Ziploc bag or two of pinto beans and Mexican cheese in the freezer, just for making this delicious South of the Border breakfast. Huevos Rancheros is quick and easy to make. If you use canned refried beans then it's even faster. 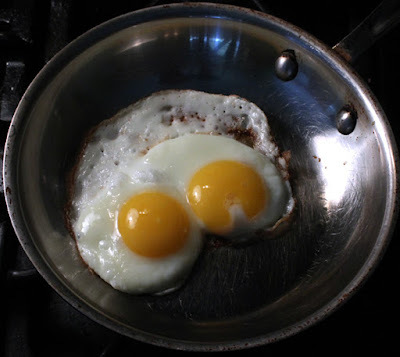 All you do is heat up some refried beans and tortillas, while frying a couple of eggs. You finish by smearing refried beans on warm tortillas, crumbling on cheese, layering on the fried eggs, and finally topping with more cheese and tangy, spicy salsa. 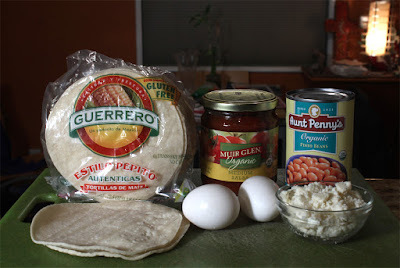 I make my Huevos Ranchero with white Mexican Queso Fresco cheese. 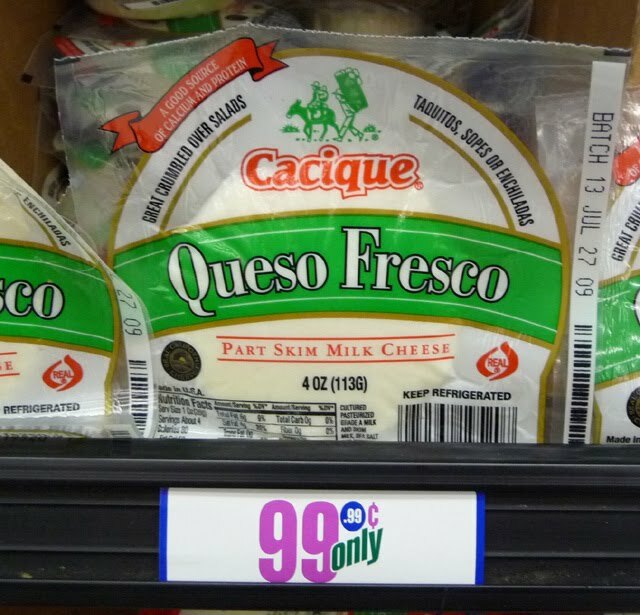 It's a medium/soft and crumbly mild tasting cheese, that is similar to feta cheese in texture, but without the sour taste. It melts slower than regular cheddar cheese so give it more heating time if you like gooey cheese, or just use American-style cheese. I like my eggs fried, that is, cooked on one side enough to get a slight crunch along the edges of eggs whites, while still keeping the yolk runny. 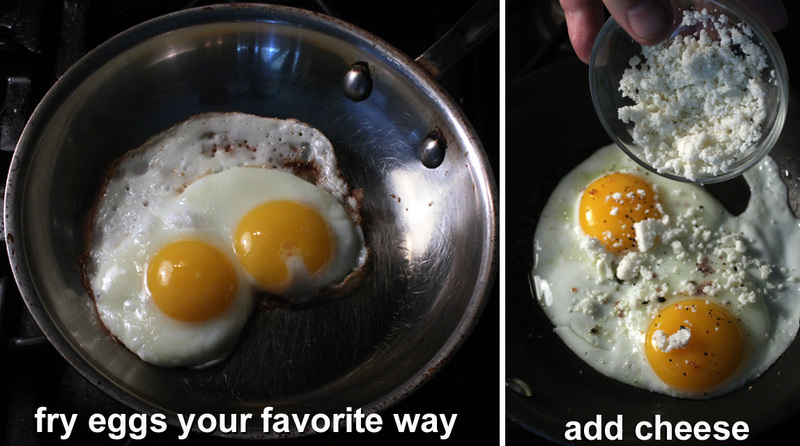 You can make your eggs anyway you like: Sunny side up, over easy, poached, or even scrambled. Usually corn tortillas are lightly heated up for a minute or two just before serving. Any favorite store-bought jar of salsa will do, but I do have some Homemade Salsas for you to try sometime, just click here to see all the links. 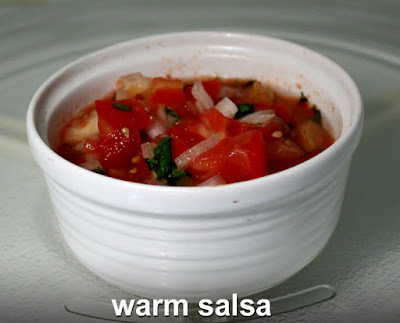 Bring salsa up to room temperature or zap it in the microwave in 15 second increments, until warm, but make sure to cover the salsa, as the tomato pieces tend to splatter. 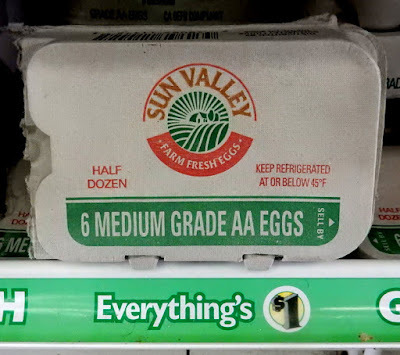 I can get all the ingredients at a 99c Only Store or Dollar Tree, but any grocery stocks corn tortillas, eggs, pinto beans, cheese and salsa at decent prices. 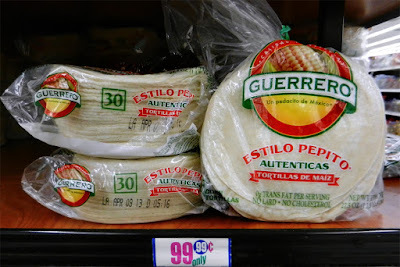 If you have a Latin market nearby be sure to check out their variety of tortillas, cheese and beans. My recipe is for one serving of Huevos Rancheros, but it's easy enough to make a few servings if you have a can of beans and a jar of salsa. Just warm up a small stack of tortillas and a pot of refried beans, while the eggs are frying -- it's an easy assembly line. 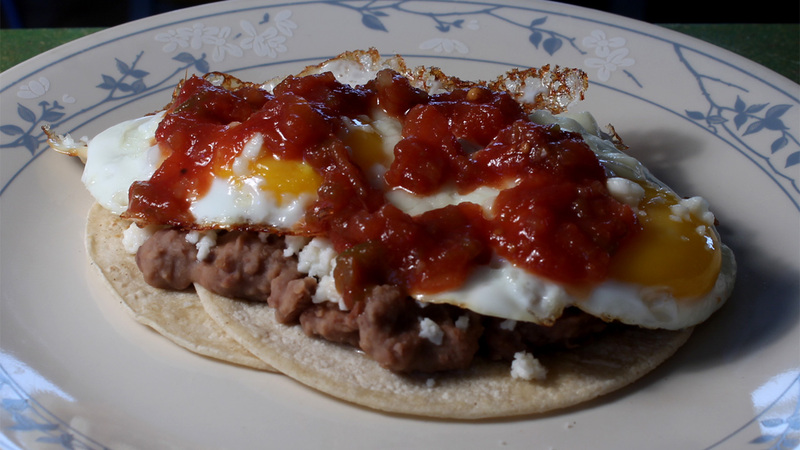 Setting out a plate of Huevos Rancheros will impress any guest. It's so satisfying and a great way to start the day. Play it here, video runs 2 minutes, 13 seconds. 1 to 2 eggs - I like 2 eggs, while my wife likes one egg. 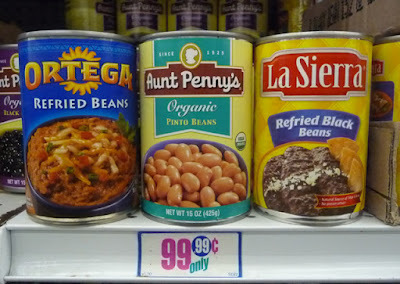 3/4 cup of refried beans - fresh or from a can. I also like to use black beans. Adjust the refried beans amount to suit your taste, add more or less. 2 corn tortillas - okay to use one tortilla for lighter breakfast. 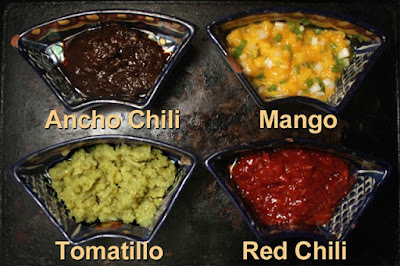 1/4 cup salsa - any amount of your favorite salsa will do, fresh or from a jar. Cheese - Mexican "queso fresco" or your favorite. Add enough to cover eggs and beans. You can use cheddar, mozzarella, Monteray Jack, or a cheese blend. 2 tablespoons of cooking oil - enough to heat tortillas, eggs, and refried beans. 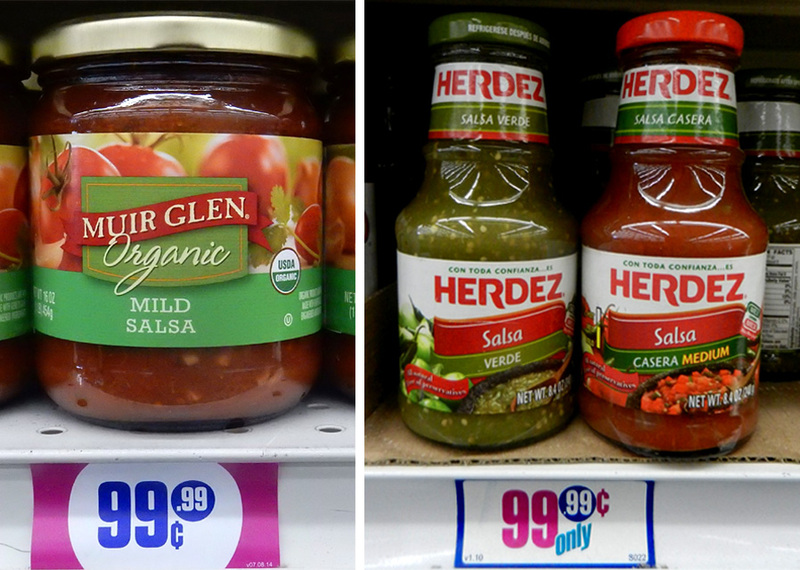 If salsa is stored in the refrigerator, then reserve a serving amount from jar and let salsa reach room temperature. Heat teaspoon of oil in pan or pot over medium heat. If you are using whole pinto beans then add them to heating pan, along with a tablespoon or two of bean broth. 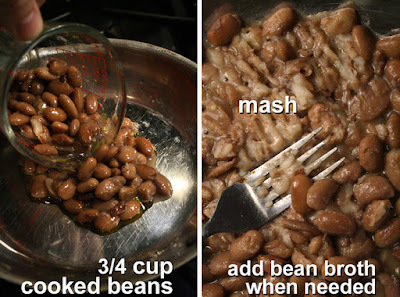 Mash beans with a fork or potato masher until they reach your desired creaminess. If you are using canned or homemade refried beans then heat them up, even in the microwave. Start heating corn tortillas on a pan or grill with a teaspoon of oil. 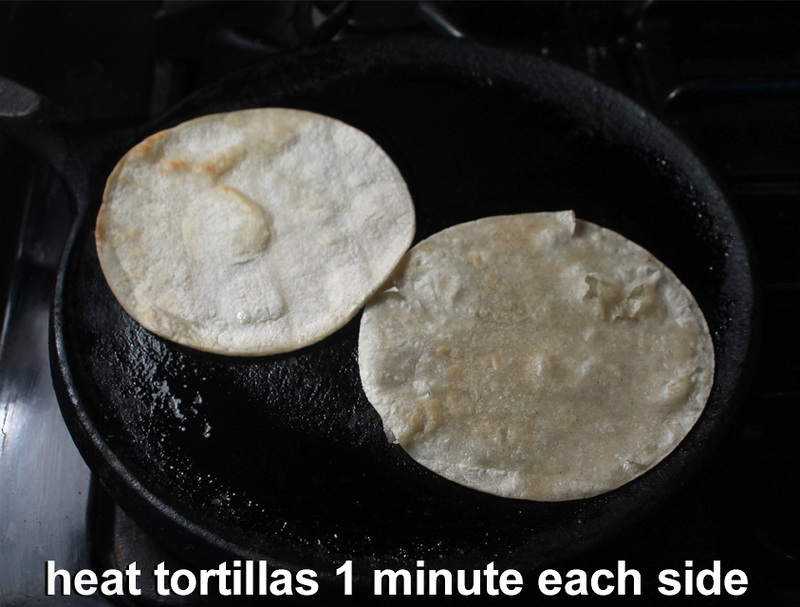 Tortillas only need a couple of minutes to heat through. 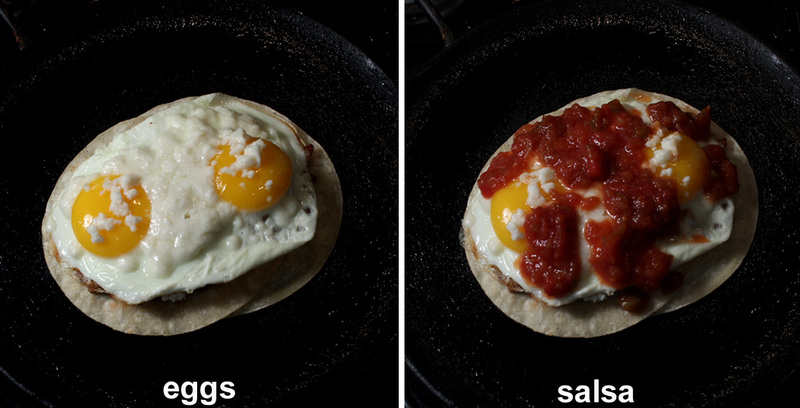 As tortillas are heating up, use your favorite method of frying eggs. 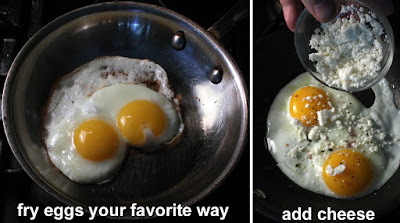 I like mine sunny side up, but you can make them over easy, or even scrambled. When eggs are 1/2 done crumble on Mexican cheese to begin melting. Regular cheese (cheddar, mozzarella or Monterey Jack, melts faster, so you can add it just before the eggs are done. When eggs are done, it time to bring it all together. On a plate add warm tortillas and spread on hot refried beans. Sprinkle on some cheese and slide on the cooked eggs with melted cheese. 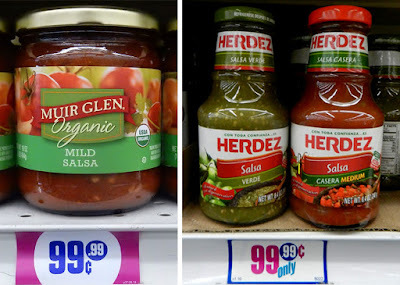 Finally top with your favorite salsa. And don't forget the hot sauce! I have a Homemade Red Beans recipe that you can use for beans from scratch (substitute pinto beans for red beans,) just click here. Pinto beans are typical for Huevos Ranchos, but mashed and refried black beans are just as delicious. You can use any favorite cheese you have on hand. And add as much as you like.You can make this dish with one fried egg or two. If salsa topping is from the refrigerator make sure to allow it to reach room temperature; or heat-up your favorite salsa on the stove top just before serving over cheese-topped eggs. You can also zap salsa in the microwave in 15 second increments, but make sure to cover the heating bowl, as tomato pieces will splatter when hot! Cold salsa on hot Huevos Rancheros is a no-no. I have a bunch of salsas recipes, just click on any name to view: tangy Roasted Salsa Verde (tomatillo,) Red Chili (2 dried types - but same recipe,) Pico de Gallo, and Mango Salsa. Thanks for all your wonderful, economical recipes. You bring Culinary Hope to the Hungry! I've been reading your blog for some time now and I really like it, BUT I still get sad that there isn't a 99 cent only store with groceries where I live. Keep up the good work.